After two years of dedicated work, the Mustang Public Schools Long Range Planning Committee which is composed of parents, community members and school staff has crafted a proposal approved by the Board of Education that will carry the district, its students and its faculty and staff through the next several years. The focus of the plan began and remained on what is best for the kids and providing not only classroom space but also room to expand the programs that bring them so many opportunities as well. 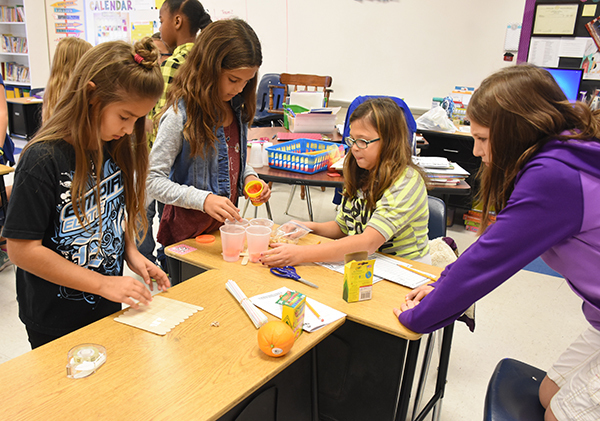 Students at Creek Elementary use a budget to purchase materials to build a structure they'll design to withstand an earthquake. Mustang Public Schools remains in a position where accommodating our growing student population is a priority. Mustang Schools and the quality of education it delivers makes it one of the premier districts in the state. Besides the world-class education Mustang provides, the positive, progressive community that supports the district brings in hundreds of new residents a year. Canadian County is the fastest growing county in Oklahoma. As a result, the district’s student population grows between 200 to 500 students annually. That’s the equivalent of adding the population of an elementary school to the district every one to two years. This bond issue would make room for new students to join the district for several years with the construction of three new schools and many program spaces. It’s important to note that the work done on Mustang High School in 2010 drastically increased its capacity. The bond proposal also includes an addition of eight classrooms, a science academy, and a freshman cafeteria/commons, all of which will expand the capacity of MHS for years to come. The Performing Arts Center would also increase capacity and decrease the load on the main campus. The Mustang Board of Education has made a commitment to keep taxes as steady as possible. This bond issue is no different. The bond issue would create opportunities for all 11,000 students. The good news is, although it's the largest bond issue the district has taken to the voters, it will have little to no impact on taxes. The need for new schools, classrooms, and program space is a wonderful problem for any school district to have. It speaks to the dedication of the teachers and administrators and the support of the community. Along with that comes the challenge of meeting the needs of our students and staff. Information about what the district has accomplished with past bond issues is available in the tabs to the left. Please take a moment to read the questions and answers below. Have a question we didn’t answer? Feel free to submit a question at right. Voters will have an opportunity to cast their ballots in this election on Feb. 14, 2017.